When you have a wood workshop, chances are you’re going to need to use, sooner or later, a router. You cannot have a router without the router bits and using the right ones on a job can make the difference between a nice and a ruined finish. Router bits come in a great diversity of shapes and styles and you should use them for creating a nice decorative effect on your wood project. What are the main types of router bits? What are the most popular specialized bits? What are the common sizes? What are the materials used for router bits? 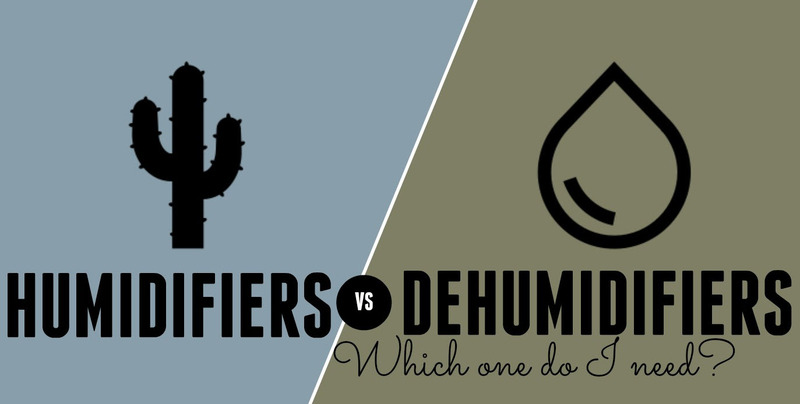 How to choose your router bits? First thing first, router bits come in different profiles, which relates to the shape of the cutting edge. They are quite the staple in the arsenal of a wood worker. They cut right into a material, creating a dado (a groove across the wood grain) or a groove. They can even hollow out a space for more inlay or mortise. They come in a great variety of lengths and diameters. They’re used for cutting a bevel of a specific angle, in order to decorate the edges of an area or to ease it. You can also use them for forming the beveled edges you need for joining multi-sided constructions. These bits are designed for cutting a rabbet (shoulder) in the edge of your work item. They’re typically guided by a spinning pilot bearing at the tip and you may buy them in set. A set of this type may also contain bearings of various diameters so that one bit creates rabbets of various sizes. The name pretty much says it all and you’re going to use these bits for cutting a decorative edge. You may find round-over bits that cut a rounded edge with a specific radius or use ogee bits that cut an S-shaped profile. Many of the edge-forming bits come with a pilot bearing. The edge-forming bits are typically used for final decoration of your project, when the edges are already established. These bits are good for trimming the edge of a material flush with the edge of another. They’re guided by a pilot bearing that has the same diameter as the cutter. The bits you’re using for specific jobs are included in this category. The molding bits (they include several edge-forming profiles into a single bit), stile-and-rail bits (you use them for shaping the frame pieces in frame-and-panel constructions), and raised-panel bits (they’re great for shaping the edges of a door panel so that they fit into the designated slot in the frame’s stiles and rails). These bits are a tad large and work for the table-mounter router. Cabinet door set- you use it for making cabinet doors. It eases up a job like this, ensuring a professional look for the project. There are two common sizes for the router bit shanks: ½” and ¼”. 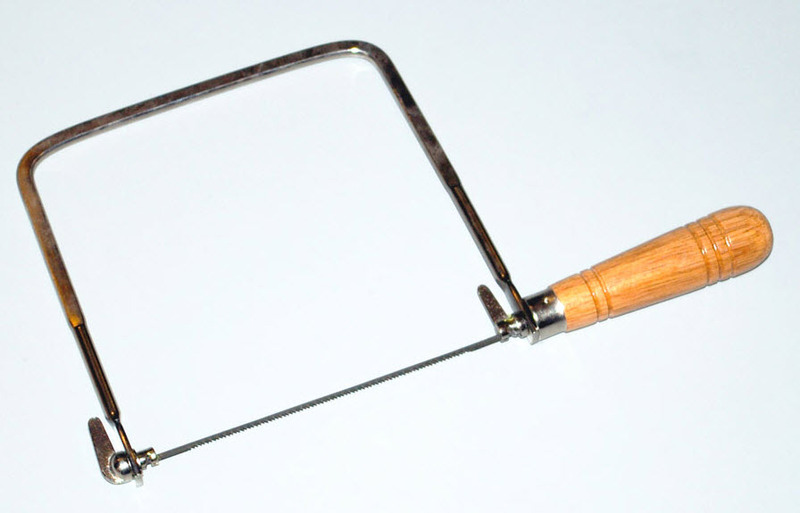 Some routers come with both ¼” and ½”, but there are models that only take the ¼” shank bits. However, try your best to only use the ½” shanks as they ensure better stability and less vibration. They also create a smoother cut and present a longer cutter life. The very small and very large profiles make the exception, but all the other router bits typically come in both diameters. When you go shopping, it’s important that you know which type of material of the router bits fits your project a lot better. This is a great option when you’re working on soft wood. In addition, it’s really cheap. Try not to use it on hardwood as it’s going to dull the bit and lead to more strain of your router. This is a bit more expensive than high-speed steel but it’s the better choice for hardwoods. It remains sharper for a longer time which is why it’s worth to pay the extra buck. Expensive and yet long lasting, the solid carbide is the most appropriate choice for some specific applications (pattern cutting, laminate or mortising). The rule of thumb is to use carbide bits and avoid the high-speed steel. Even if you’re going to pay a bit more for the carbide bits, they sure pass the durability test. If the price isn’t a problem for you, get the ones that come micro grain carbide. You know you’re getting good router bits if its cutting edges show no gaps where the edges are brazed to the body. The cutting edges should be free of tiny chips. If you’re going to turn the bit against your fingernail a bit, it should skim off a shaving. If it doesn’t, it means it’s not sharpened right and it’s not going to give you good results. You should always go with the ½” shanks if your router takes them. They ensure a smoother cut and typically they don’t bend or break. Get the bits with enough metal behind the cutting edge, which reduces the risk for kickback that the deep bites and fast feeding may produce. When you’re looking to obtain smooth cuts, the bits with two cutting edges are always going to give better results than the single-edge ones. In addition, flutes set at an angle to the shaft are going to slice the wood fibers and not chop them. Keep in mind that bits with pilot bearings are going to perform better and for longer time if they come with a dust shield between the bearing and the bit body. The shield is going to maintain the bearing clean, ensuring a smooth result. Always have in mind the specific of your projects. Get the router bits you’re using most of the time and buy the special ones when you’re planning a special project. Take a look at your wallet when buying and make time for selecting the right options for your woodwork. 1). 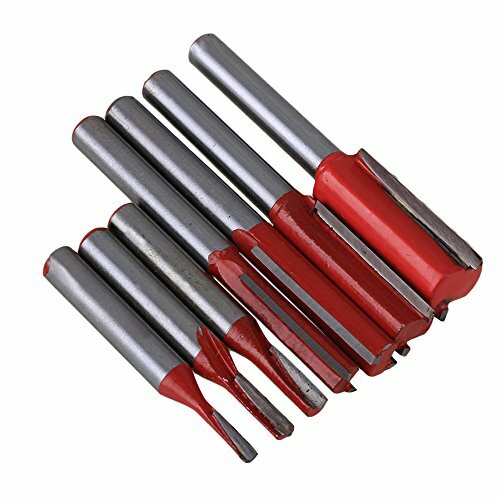 If you’re the occasional wood worker or an entry-level one, the CNBTR 1/4 Inch Shank Dia Silver & Red Carbide Woodworking Straight Router Bit Set Pack of 7 is just the right addition for your woodshop. The router bits come with a sharp edge and run pretty well. They’re made with high frequency welding technology and present high hardness. You may use them for cutting plywood, composite materials, hardwoods and softwoods. Their versatility isn’t bad at all. As a matter of fact, it’s one of their main assets. You can use them on CNC and various automatic routers, hand-held or table-mounted portable routers. They cut clean and nice and ensure good precision as well. They’re a good value for the price and make the perfect choice for the beginner. On top of everything else, they come for an amazing price, which may seal the deal for many. As long as you’re focusing on the goods, you should get the router bits, especially if you’re an entry level woodworker and your money is tight. 2). When your wallet is thing and you want to get a nice set of router bits, take a leap of faith with the Hiltex 10100 Tungsten Carbide Router Bits | 15-Piece Set. The set is quite a nice surprise for the money and the YG8 tungsten carbide blade is accurately machined. The router bits ensure precise cuts on all sorts of woods and do make an impression with their resistance to heat. The main construction is made with tough alloy steel and the power coating finish gives a nice durability to the router bits. The enclosed bearing roller is going to provide smooth and aligned action and the ¼ shank is going to fit most routers out there. You may use this set for an impressive and various types of jobs. You may use them for trimming, ending, veining and even grooving. They’re a solid option for the hobbyist and the professional carpenter. The router bits have a good balance and they’re pretty sharp. They come with a wooden index case which save you time on the jobs and solves the problem of organizing as well. 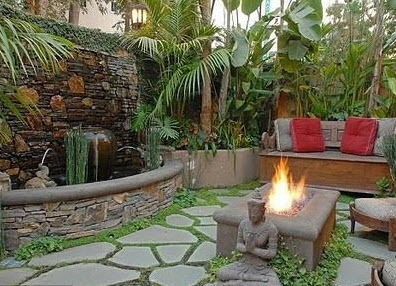 They’re going to get you through a small project and don’t disappoint, considering the price. Beggars cannot be choosers and this set surpasses expectations as it’s versatile and quite reliable for plenty of small projects. 3). 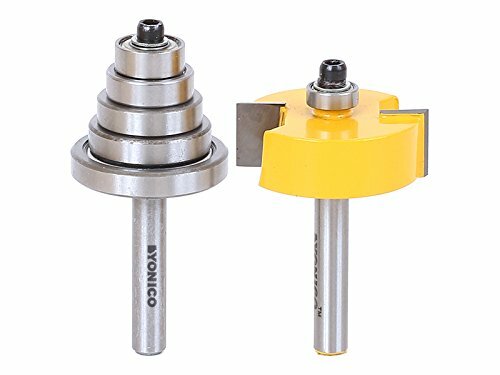 If you’re looking for a good set of rabbet router bits, the Yonico 14705q Rabbet Router Bit with 6 Bearings Set -1/2-Inch 1/4-Inch Shank is a one choice that is worth to try. The set includes industrial quality router bits. The bodies are made with tough hardened steel and the C3 Micro-Grain Tungsten carbide cutters are going to take a good amount of use. The router bits are also heat resistant as they come with Teflon coating so you may confidently use them in long time jobs. The router bits also present an anti-kickback design, which is only going to ease up your jobs. The smooth running bearings provide a smooth and clean job. We also need to highlight the precise depth and the width control. The router bits work fine and there is no vibration involved. The set comes in a wooden box which keeps them well organized and protected. The set includes 6 bearings that are going to make rabbet cuts in 6 various sizes. All things considered, for the quality of the build and reliability, the set is always a valid and affordable addition to one’s wood shop. 4). Going shopping for a versatile and reliable set of router bits may put you in the pickle, but you shouldn’t come back home empty handed. 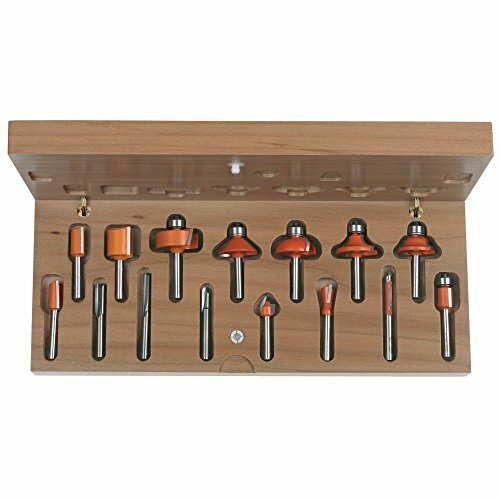 The Router Bit Set- 24 Piece Kit with ¼” Shank and Wood Storage Case By Stalwart is going to be just the right addition to your wood shop, especially if you’re an entry level wood worker. The set includes 24 carbide tipped router bits that have a good build, taking the use pretty well. In addition, the set includes a good variety of router bits so you may try various wooden projects. Edging, trimming, woodworking, veining, and grooving are only some of the projects that you’re going to be able to develop with this set. It works for hobbyists of all experience levels and professional carpenters as well. In addition, the set comes with an Allen wrench so that you may remove the bearings. The router bits come with a wooden case which keeps them well organized. Not only that you solve the storing problem, but you’re also going to win some time during your projects as everything is within reach. The router bits come oiled and ready to use out of the box. They don’t get dull that easy and they have a solid build. All in all, as the set includes so many types of router bits and it’s a solid option for the entry-level wood worker, they’re always going to be a good option and quite a bang for your buck! 5). Especially designed for great performance in plywood joinery, the Freud 89-660 Undersized Plywood Router Bit Set 1/4 -Inch Shank are going to provide nice fitted groves and dados. The undersized plywood bits give an amazing gap-free joints, as opposed to standard bits. You may use them for creating joints for bookcases, cabinets, shelving and so on. They present a down shear design on the 23/32” which eliminates splits. The router bits feature TiCo Hi-Density carbide which is going to take the challenges of routing plywood that has high glue content. In case you don’t know by now, this is why the standards bits get dull so fast. The list of good things continues with the Non-Stick Perma Shield Coating which protects the bits from overheating and reduces the risk for pitch building up. You may use them for several thickness of plywood: 7/32in, 15/32in and 23/32 in. The set comes in a wooden case that provides good organizing and protection at the same time. All bits are 1/4in shanks and cut all composition materials, hardwoods, plywood and softwood alike. You can use them on hand-held and table mounted portable routers. Sharp and long lasting, the router bits present zero play and are a wise investment for the dedicated wood worker. Long story short, as they’re sharp, long lasting and cut clean, you shouldn’t skip them when completing your accessories in the woodshop. 6). 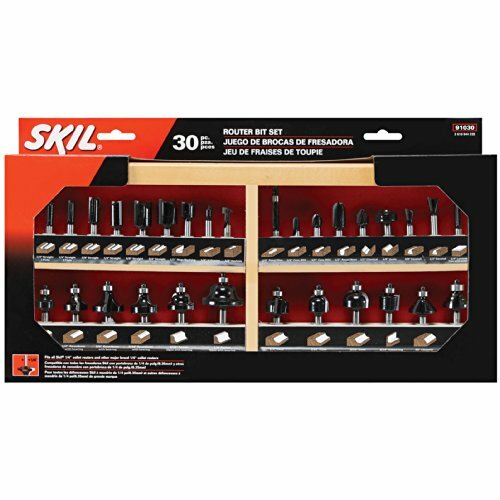 The comprehensive Carbide Router Bit Set – 35 piece 1/4 shank NEW BITS by EDMBG is one set of router bits that an entry level woodworker shouldn’t skip on when shopping. The set includes no less than 35 pieces that are made with Tungsten Carbide tipped, covering most needs in a wood shop. The diversity is really impressive and you get to choose from so many types. Cove, dovetail, classical cove, beading, rabbeting, mortising, round nose, Roman Ogee, Rodner Over- are only some of the types that this set includes. The router bits are made using sealed bearing. They take the regular use in a shop and may be a valid option until you’re willing to pay the extra buck for the high end router bits. The metal box looks solid and keeps the router bits well organized. Every name of the router bits is listed on the box below each bit, so it’s going to be easy to put them back in place or learn their names in the first place. The box comes with handle and twin clasp closures, making the storage a breeze. For the versatility and good organization, the set sure deserves the chance of try, especially if you’re all new in the woodworking world. 7). If you’re the middle-level router and want to involve in various projects, but you’re not ready for the high dollar router bits just yet, have a go with the KIL 91030 Carbide Router Bit Set, 30-Piece. Not only that the set includes a good variety of styles of router bits, but it also doesn’t disappoint in terms of performance or durability either. The set include 30-piece carbide router bits and they’re the most popular cutting profiles out there. Inside the box you’re going to find straight bits, dovetails bits, hinge mortising bit, ogee bit, ogee bit with fillet, keyhole bit, cove and bead bit, round over bit, rabbeting bit and classical bit. The set also contains ovolo bit with bonus hex key and replacement bearing. All the router bits are ¼”. The router bits ensure a clean cut and you may not need to sand the edges of your pieces. They have a good build and seem to be able to handle the moderate use just fine. 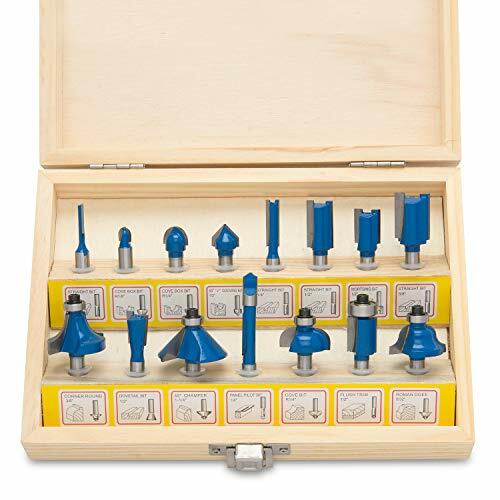 The solid wood felt lined case protects the router bits and keeps them well organized. It comes with a window so it’s easier for you to see what’s inside. A penny saved is a penny served and even if you don’t see it, this set is really a great purchase for anyone. Stay focused on the good side and see the set for what it truly is: a versatile, dependable and affordable set of router bits that satisfies the needs of a mid-level router. 8). 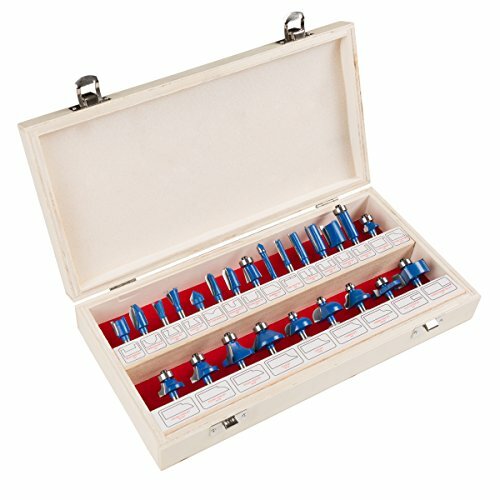 One thing you cannot complain about in the case of MLCS 8369 1/2-Inch Shank Carbide-tipped Router Bit Set, 30-Piece is the variety as this set does includes many types of router bits. As a matter of fact, the set provides a nice selection of most commonly used bits. 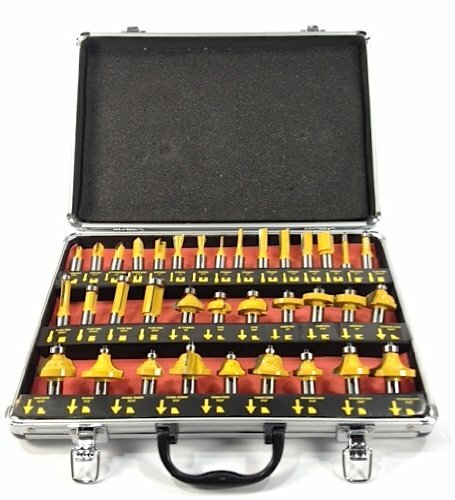 The set contains good quality 1/2in shank carbide-tipped bits, taking the moderate use for a good amount of time. Inside the box you’re going to find flush trim, cover, dovetail, roman ogee, round over, round nose, V-groove, panel pilot and many more. In addition, the set also includes an Allen wrench and one bearing that you may use for turning the round over bit into beading bit. The build of the router bits is good and they cut nice and clean. They’re going to be a great option for anyone using them only from time to time. The router bits come with a wood storage box which provides both protection and efficient organization too. The router bits may not take the heavy-duty jobs in a professional woodshop. Not for life, anyway. Despite the minor problems, the set still stands as a reliable, versatile and good quality set of router bits that any hobbyist may rely on. 9). Taking your wood working skills to the next level is almost impossible if you’re not using the right tools an and accessories. 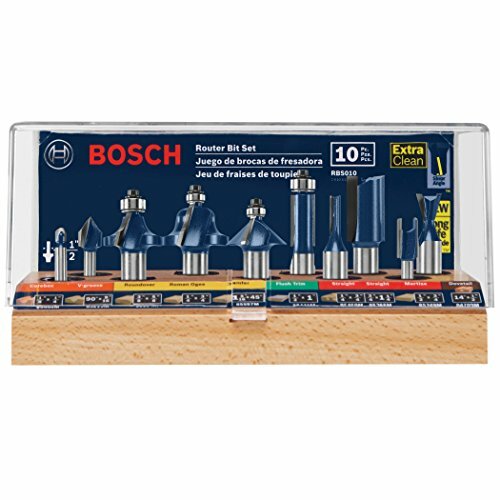 If you’re dedicated enough or you’re doing it for a living, you should know that the Bosch RBS010 1/2-Inch and 1/4-Inch Shank Carbide-Tipped All-Purpose Professional Router Bit Set, 10-Piece is never going to disappoint you in any way. The set covers pretty much all sorts of jobs of a professional woodworker- as long as you know what you’re doing. The set includes router bits for trimming, straight, dovetail joinery, decorative edging and much more. The high-quality micro-grain carbide tips of the router bits ensure wear resistance and sharper edges for the accurate finishes. They cut nice and smooth for a long time. The router bits’ present uniform hardness in shank and the bodies are tough, so they’re going to take the intense use for quite some time. The controlled cut design and good balance is going to reduce the risk for kickback, allowing smoother cuts and lower vibration. They are 1/2in shank bits that stand out with their stability and reduced vibration during cutting. 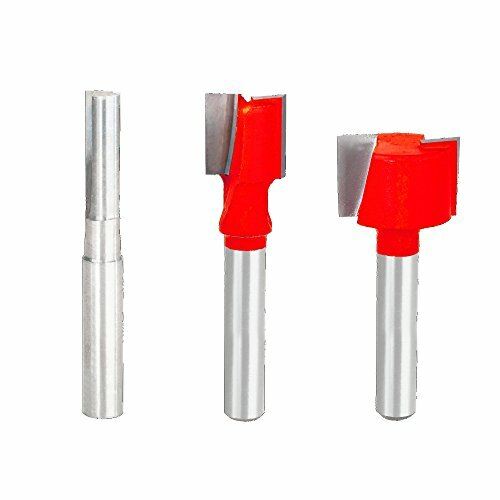 You should use the ¼ in shank bits for the thin profile jobs. In addition, the router bit set contains new compact ball-bearing pilot, guiding the bit along the edge of the material. Chamfer bit, round over bit, Roman Ogee bit, dovetail bit, V-groove bit- are only some of the types of the round bits inside the box. The rounder bits come in reusable storage case that features a solid wood base and a clear plastic top to see what’s inside the box. The names of the router bits are written and the case has a durability feel to it. Regardless of the minor problems, for the reliability, strong build and performance, the set is worth every single penny. 10). Even if the price tag may be the pet peeve in the case of CMT 800.001.00 15-Piece Router Bit Set, 1/4-Inch Shank, the set is a wise investment to make for the long run. 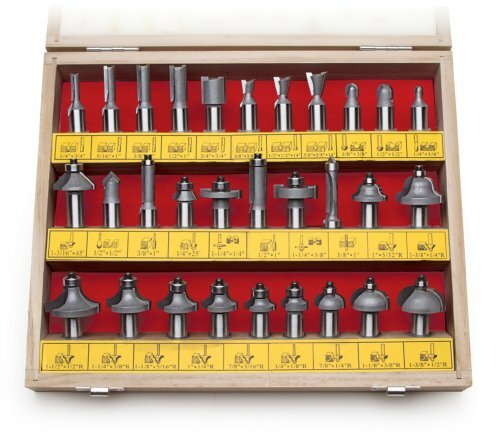 The set includes 15 useful router bits that cover the main needs in a professional wood shop. Straight, profile, rabbeting, chamfer, dovetail bits are only few of the bits included in the box. The router bits present 2Sinter Hip hi-Density Industrial Chrome Carbide cutting edges which are going to take the use for a very long time. Some of the bits come anti-kickback design, increasing the safety on the jobs. At the same time, some of the router bits’ feature bearing which eases your template work. Nevertheless, all router bits stand out with a solid steel body or solid carbide body. 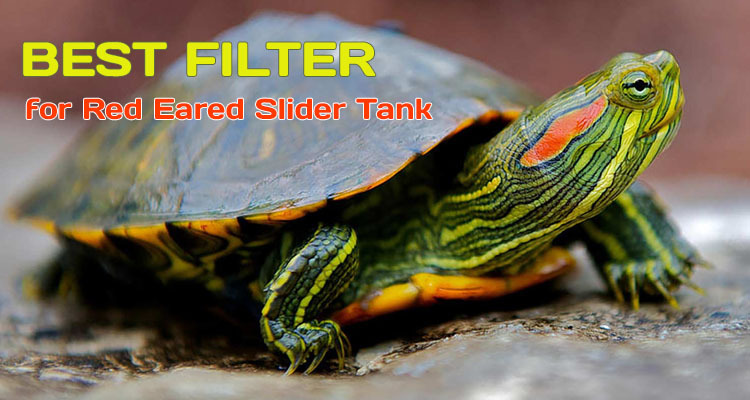 They have Non-Stick Orange Shield Coating which reduces the risk for overheating. The router bits come with silver-copper-silver tri-metal brazing, which improves their resistance and makes the mirror finish 3 more times longer lasting. 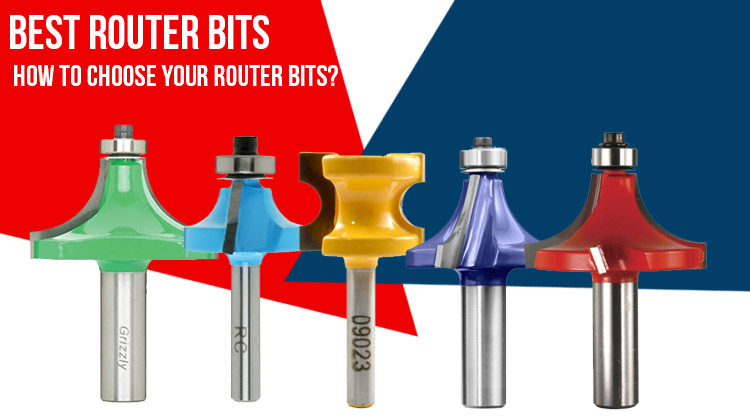 The Wood Magazine rated the CMT orange bits as the best overall router bits, when compared to other brands out there. On top of everything else, the router bits come organized in a specially designed Italian hardwood case that protects them when not in use. Reliable, long lasting and made to take the use until the end of time, the router bits are going to make any professional woodworker proud, even if they’re going to leave a deep hole in your pockets.